This beautiful fine bisque Porcelain Ballerina Doll has a vintage look to it and is the perfect gift for your little Ballerina Doll collector. 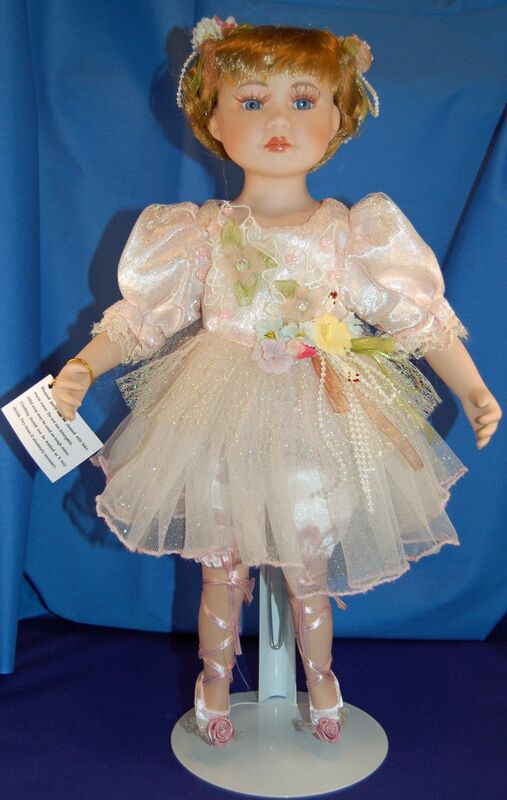 The Ballerina Doll measures about 16" from head to pointed toe. She has lifelike blue eyes with long eyelashes. Her braided blonde hair is adorned with pink, blue and purple flowers and pearls. Her puffed sleeved lyrical tutu is pale pink and trimmed in pink, blue and yellow flowers with pearls and a mauve and green bow. The accented floral pink ballet slippers complete her outfit. This Ballerina Doll is crafted of delicate painted ceramic head, arms and legs with a soft stuffed body. She will bring joy to the ballerina in all young hearts. Delicate Hand Painted Features with a floral lyrical tutu. PLEASE ORDER EARLY FOR THE HOLIDAYS! JAZ CANNOT GUARANTEE DELIVERY OF ANY GIFT ITEMS AFTER DECEMBER 20TH ON "STANDARD SHIPPING. SORRY WE CANNOT OFFER EXPRESS SHIPMENTS THIS YEAR. ALL ORDERS WILL GO PRIORITY MAIL USPS. ORDERS WILL BE ACCEPTED UP TO 12/10/2018 BASED ON THIS CONDITION. ANY ITEMS ORDERED AND SHIPPED AFTER THESE DATES WILL NOT BE GUARANTEED DELIVERY BEFORE CHRISTMAS. SORRY FOR ANY INCONVENIENCE THIS MAY CAUSE, PLEASE PLAN ACCORDINGLY. MERRY CHRISTMAS AND HAPPY HOLIDAYS TO ALL OF OUR LOYAL CUSTOMERS! WE ALSO WISH YOU A HAPPY NEW YEAR! JAZPIZAZ.COM WILL BE CLOSED FROM DECEMBER 22 THRU JANUARY 3, 2018. ORDERS WILL BE ACCEPTED AND CAN BE PLACED BUT WILL NOT BE PROCESSED OR SHIPPED UNTIL JANUARY 3, 2019. THANK YOU FOR YOUR UNDERSTANDING. Hair Bun Nets Offering a variety of Hair Bun Nets in both Mesh and Ribbon Styles. Great for Dance competitions!